What Day Of The Week Is November 5? 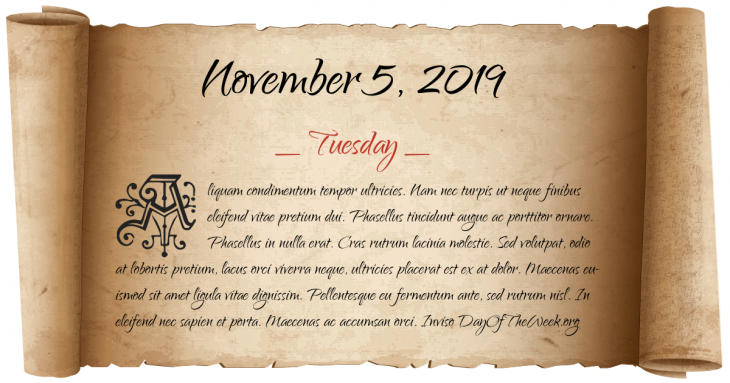 November 5, 2019 is the 309th day of the year 2019 in the Gregorian calendar. There are 56 days remaining until the end of the year. The day of the week is Tuesday. Crimean War: The Battle of Inkerman. Women’s suffrage in the United States: In defiance of the law, suffragist Susan B. Anthony votes for the first time, and is later fined $100. President of Pakistan Farooq Ahmed Khan Leghari dismisses the government of Prime Minister Benazir Bhutto and dissolves the National Assembly of Pakistan. Who were born on November 5?